The Capital Markets Cooperative Research Centre (CMCRC) is one of 35 national research centres of Australia with a mandate to improve the quality of securities markets. In line with that mandate CMCRC has built a number of world leading technologies that are based on core skills in data management mining and visualisation. These technologies include the SMARTS market Surveillance System currently in use by 50+ national exchanges and regulators and 120+ brokers across 50 countries. This technology was sold to NASDAQ in 2010. Another world leading technology was CMCRC’s development of the Thomson Reuters Tick History Service (TRTH), which ingests 2m transactions (intraday trade, quote and information announcements) a second for every securities market in the world and makes the data available to Reuters clients through SaaS in as little as 20 minutes. At the heart of the software are 100+ pre-programmed metrics representing fairness and efficiency, including dozens of academically tested metrics for transactions costs and volatility. Notwithstanding the wide variety for pre-programmed metrics, MQD also has a python language that allows users to develop and populate their own metrics. Also included as standard in the software is a list of all major market design changes in each marketplace and a visual front end that allows one to look at the impact of such changes on metrics for fairness and efficiency making it an “academic–in-a-box” when it comes to assessing the implications of market design change for market quality. Metrics are available at the security level, a group of securities level, index level, a decile of securities level or a market wide level. While the system comes with publically available data as a standard option, data can also be incorporated from more private sources such as that typically available to an exchange or regulator. The software is cloud based allowing users to burst up or down depending upon the number of markets they need metrics for in a particular timeframe. The very latest use of the software is by data owners such as exchanges. CMCRC is currently placing MQD alongside the private data in the private cloud of one of the world’s top three North American exchanges with a view to enhancing the use of its data by third party data users. Unique to the modus operandi of the CMCRC is the ability to supply smart human capital alongside its technology. In this sense it is worth emphasising that new technology often takes a lot longer than anticipated to benefit a new user because the third party user is already operating at 99% capacity and because it takes time to learn the full capability of a new technology. To mitigate these problems CMCRC trains smart human capital in how the technology works and puts both onsite for a three-month evaluation period. The total cost is US$50k setup and US$25k per element of human capital. At the end of the trial the expectation is that the on-going cost of the technology and human capital will be met in full and be a small fraction of the total returns from the sale of better data. View a summary of key market metrics all on one page. Drill down for more details. 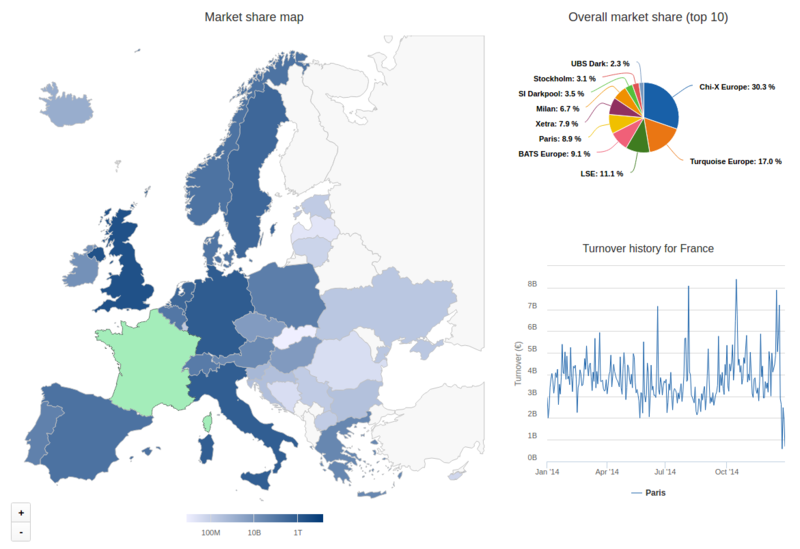 On a daily basis, the CMCRC extracts, transforms and loads (ETL) publicly available financial market data for over 50 global markets , which serve as the core data underlying the Market Quality Dashboard. In order to maintain processing efficiency and data quality at high level, the CMCRC has developed a unique ETL Workflow Engine that has automated data management and outlier detection. This Workflow Engine is designed such that private market data can be ingested without any loss of security and efficiency. The system can connect to any APIs for private data extraction. In the case of proprietary private databases without standardized API, the CMCRC develops customized converters to transform the data to the Blueshift  format. Benefiting from a comprehensive application of Docker sandboxes, the Workflow Engine can be deployed in both local cluster environments and third-party cloud facilities. System resource is managed by the Workflow Engine’s smart auto-scaler that is built and optimized based on CMCRC extensive experience with big data . Data security is further enhanced by segregating derived market quality metrics from the underlying database. As an added bonus, such segregation also allows metrics from external and internal sources to be consolidated without interfering with users’ private data. While currently we download 50 marketplaces in fact the only limit off the number of markets are the data feeds we use. In the case of the Thomson Reuters Tick History Service more than 300 markets are available. 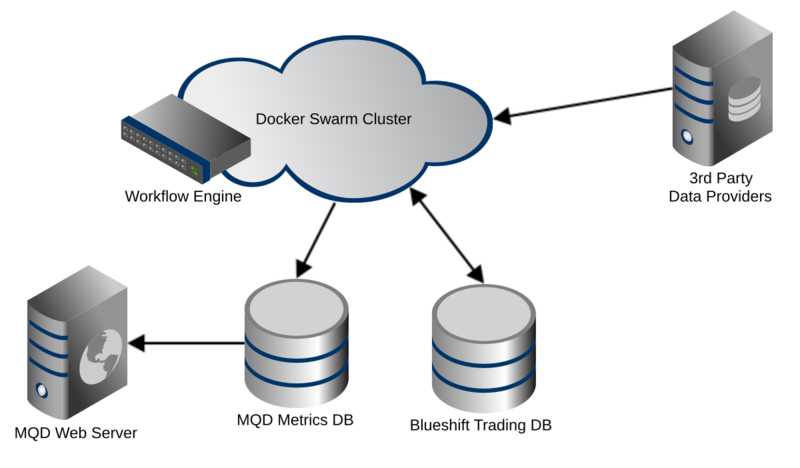 Blueshift is a generic database structure developed by the CMCRC to store and consolidate time and sales data, full order book market data, market participant information, index updates, corporate actions data and unstructured text data. We built the original Thomason Reuters Tick Data Service which currently ingests more than 2 million transactions a second (form every market in the world) and makes the data available to commercial clients within 20 minutes. measures the frequency of a trading venue/broker unable to execute client’s order at the prevailing best price. This metric can only be generated by using private data with participant information. measures how much the actual trade price deviates from the mid-point. It represents the actual, round-trip cost of trading to the liquidity demander. measures the reward for liquidity provider to be patient (with configurable grace period). measures the private information contained in trades, or equivalently the amount of adverse selection cost incurred by the liquidity provider. measures indicative round-trip transaction cost, which is defined as the difference between the bid and ask prices. It is aggregated over a period of time by computing the time-weighted average of each quote observation in-force. is calculated by dividing a venue’s effective spread by the national quoted spread. It measures the variation in transaction cost between an individual trading venue and the consolidated national marketplace. measures the frequency of a trading venue having presence at the national best bid or offer across instruments. measures the frequency of a trading venue having simultaneous presence at both of the national best bid and offer in a security. measures the aggregated dollar depth for moments when a trading venue has presence at the national best bid or offer in a security. measures the number of quote update messages (subject to the number of depth levels available in the data source). 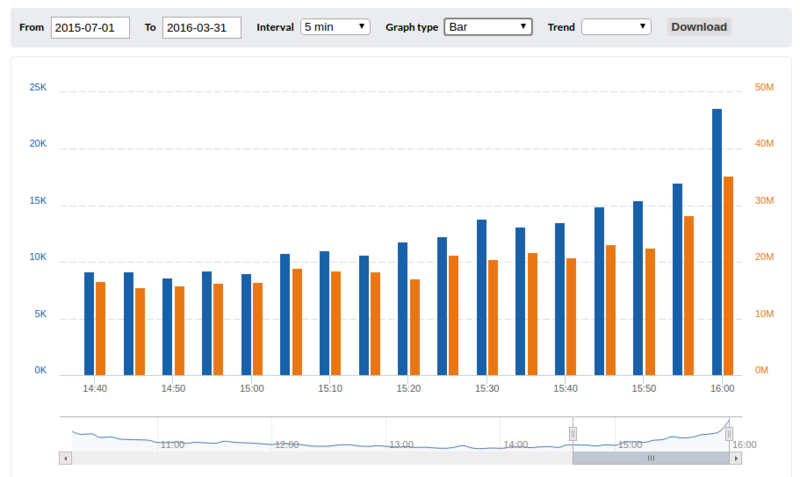 is calculated by dividing the number of quote update messages (order transactions) by the number of trades. It is the most commonly used metric to measure HFT activity. Full order book data is required to calculate the order to trade ratio. 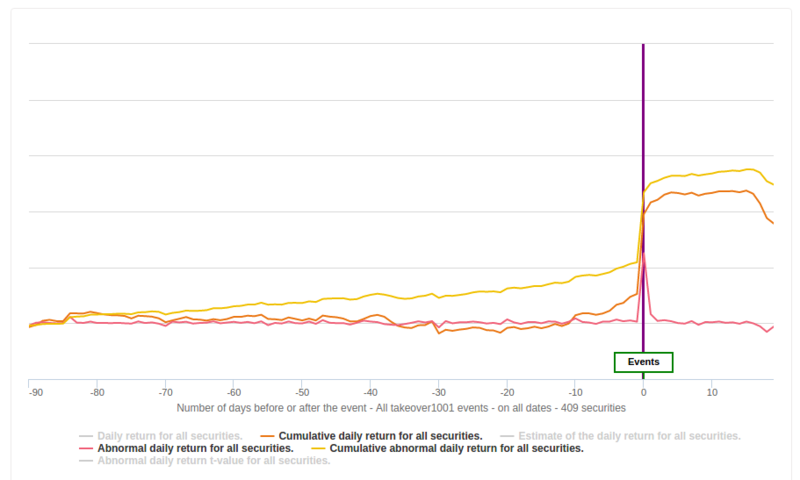 measures the daily close price return volatility. measures the intraday mid-point price return volatility (with configurable grace period). measures the intra-day autocorrelation of mid-point price return (with configurable grace period). Efficient market is expected to have low autocorrelation in mid-point price return (i.e., <0.5). measures the linearity of variance of mid-point price return in terms of data interval. In efficient market the variance of mid-point price return over t minutes (e.g., 30 mins) is expected to be close to k (e.g., 6) times the variance of mid-point price return over x minutes (e.g., 5 mins), which is equivalent to a variance ratio around 1.
test the existence of cointegration relationship, which refers to price deviation in different venues for the same security in the short run due to trade frictions (such as taxes, bid-ask spread, and brokerage fees etc.) and variant reaction to new information. These two measures are widely used to measure bid-ask bounce (i.e., the price bounces back and forth between bid and ask), tick discreteness (i.e., the minimum price movement), and temporary deviations from intrinsic value due to illiquid market. are derived from Common Factor Share and Information Share and measure how fast new information is impounded in the price. By using publicly available data, the manipulative value of an incidence is calculated by aggregating all trading during the manipulation window. When private data with participant information is provided, the incidence (the manipulative value) can be detected (calculated) with fewer false positives. measures the frequency of a participant creating false impression of an active market in a security. This metric requires private data with participant information. measures the frequency of abnormally large quantity of quote update messages in a short time interval. This metric is often used to detect manipulation by HFT. An Info Leakage incidence is triggered when the excess returns during pre-event window before the release of price sensitive information of a security is abnormally larger than the rolling benchmark (e.g., X number of days before the announcement). Abnormal returns are calculated by using the market model. This metric produces fewer false positives when generated by using private data with participant information. measures the frequency of a broker/trader taking advantage of its client by trading ahead of client’s big order. This metric can only be generated by using private data with participant information. measures the average time interval between the entry of an order and its execution (requires full order book data). This metric is often used to measure the intensity of HFT.